Dr. Sterling Glines earned his Doctor of Chiropractic degree from Parker University in Dallas, Texas. 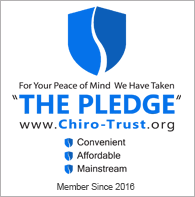 He has also completed each section of the National Board of Chiropractic Examiners (NBCE) tests, the NBCE physiotherapy exam, and the Washington state chiropractic licensing examination. Prior to attending Parker University, he completed his undergraduate requirements in southeastern Arizona and Idaho. While an undergraduate, Dr. Glines was elected as President of the Cochise College Student Government Association. While at Parker University he helped start, and then became the first president of, both the Parker Laser Club and the Parker Practical Shooting Club. He is also the former co-captain of a successful semi-professional paintball team. Some random facts about Dr. Glines: He has traveled extensively throughout the United States having visited 45 of the 50 states. He served a full time mission for his church from 2005-2007. Dr. Glines is also an avid outdoorsman, competitive shooter, and adrenaline seeker. Friendly, they call you by name. Professional doctors absolutely the best. I was in a lot of pain on my first visit. Now 14 weeks later I am better than ever!